Lu Yuan who plays Mrs Jiang in "Never Old"
BEIJING - Sept. 14, 2018 - PRLog -- 89-year-old Chinese actress Lu Yuan has won the Best Actress Award at the 14th Kazan International Film Festival in the Republic of Tatarstan (4th - 11th September, 2018). The film Never Old features Lu as a mother slipping into senile dementia while her son, Jiang Yi, tries to come to terms with the rapid deterioration in his parents' health. Lu gives an exquisitely sensitive and unsentimental performance in a film which focuses on the near-universal human experience of seeing one's parents, who from a child's eyes once seemed godlike, descend into infirmity. 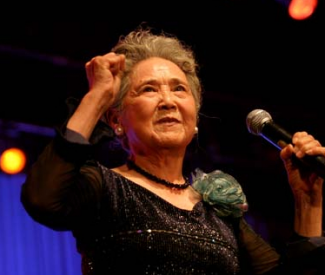 Born in 1928 and a veteran of Chinese theatre and TV since the 1950's, Lu has previously been runner up in China's Flying Goddess Award, as well as winning several provincial acting awards. Speaking of her part in Never Old, Lu recalled: "A few years ago, Mrs Qin Yi directed and starred in a movie at the age of 93. Qin Yi told me that people our age have very few opportunities to act in films and we should act whenever possible. As long as we can act, life has more meaning and we are more willing to live on." The film almost never made it to the festival due to a corrupt hard drive containing the master copy. At one point, the film was feared lost and had to be withdrawn from competing at the 7th Zabaikalsky International Film Festival in May. Subsequently, experts were able to salvage the drive which enabled it to be screened at Kazan, where it has notched up its first international award for what is director Hua Yuan's debut feature.